Last weekend The Boyfriend and I took a little trip to London’s ‘most romantic restaurant’ (awarded by Harden’s Restaurant Guide) to celebrate his birthday. Considering that I missed the entire event lat year as I was working abroad for a couple of months, I figured this year was my opportunity to make up for it so we went all out! Clos Maggiore sits just up the road from the main piazza at Covent Garden a few doors down from Carluccio’s flagship restaurant. With a concierge in the hallway to greet you and take your coats, entering Clos Maggiore you feel as if you’ve been whisked away from the hustle and bustle of Central London into a luxurious boutique hotel in the French countryside. And this is before you’ve even caught a glimpse of the spectacular dining room. Sitting down in the dining room you really are a world away from the crazy city outside. With columns and a ceiling adorned with apple blossom and the spectacular use of mirrors, the small dining room is transformed into a simply stunning French patio garden. We were seated to the side of the room with both of our place settings positioned beside each other, facing out into the room allowing for more intimate dining and for us both to fully appreciate the beautiful setting. This is all complemented by tinkling piano music in the background, just loud enough for you to notice it but not so loud that the room is noisy or that you have to raise your voices above it. I know I’m going on about how lovely the place itself was when you all really want to hear about the food but I’ve never been somewhere that has got it’s atmosphere/ambience so absolutely perfectly spot on. 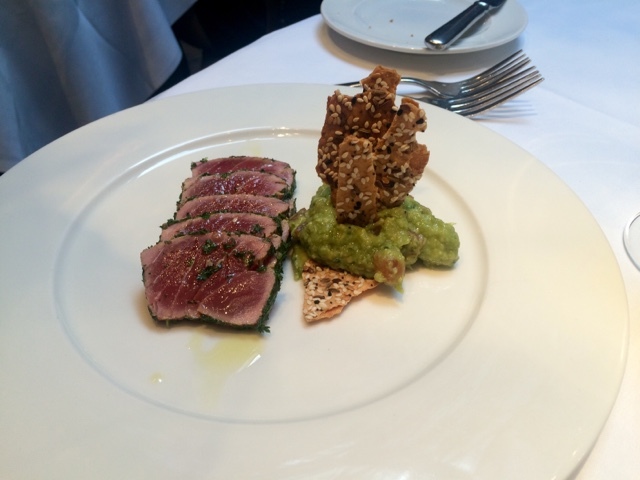 Clos Maggiore hits you with the romance full on and absolutely sweeps you off your feet. Okay, okay… now I’ll talk about the food. 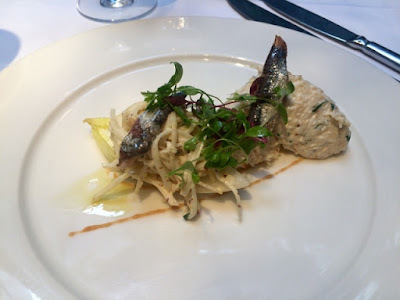 We were ordering from the weekend set lunch menu which is an incredibly reasonably priced £35 per person and includes three courses and half a bottle of wine each. There are supplements for certain menu items and for side dishes, but I think this is pretty great value for the quality of the place. The set menu was also large and varied enough that it was not at all limiting in what you could have. There was also unlimited bread served with the starters. Of the selection of fresh breads, still warm, the focaccia was my personal favourite. For my starter I chose the crab with a celeriac remoulade. The crab meat was served in a creamy herby quenelle which, far from being mushy, held its flavour and texture beautifully with a good level of creaminess that didn’t overpower the shellfish. The freshness of the celeriac on the side complemented it beautifully. The Boyfriend had my second choice of starter which was seared tuna. Just seared at the edges, the slices were meaty and flavoursome and the avocado side made a really refreshing change from the more spicy or citrus Asian inspired flavours commonly paired with this fish in a lot of restaurants. 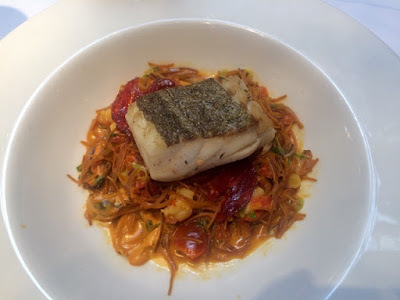 We both opted for the same main course of cod which came on a bed of vermicelli with chorizo, mussels and prawns. The fish itself was beautifully cooked. The skin could have been crispier and it was a touch under seasoned, but the actual flesh itself was done beautifully. The sauce was the highlight of this dish with a beautifully balanced flavour that was at the same time both smoky and creamy. I was also impressed with the amount and the size of seafood incorporated in the sauce as it was substantial and meaty. Often the seafood in sauces can be an afterthought and a bit small and sparse, here, care and attention was put in to make it a highlight of the dish as opposed to an afterthought. I had to sample the mushroom side dish as they’re absolutely one of my favourite vegetables and I rarely get to eat them at home as the rest of the family thinks they’re the spawn of the devil. The only thing sinful about this side dish was just how good it was. 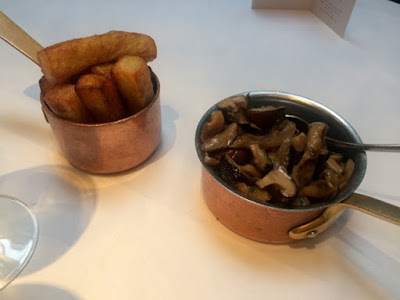 A mixture of different types of mushroom allowed for variety in both texture and flavour and they’d been cooked perfectly to allow a good bite with no sloppiness or rubberiness whatsoever. The Boyfriend’s choice of side was triple cooked chips. Perhaps not the most logical thing to pair with our cod dish, but a good opportunity to try a ‘posh chip’ and see how well it could be done. They were ok. For me, a chip is a chip and if anything these weren’t the best I’ve ever had and definitely lacked seasoning. However for those who really love chips they are there and they’re not bad. Desserts were a good selection offering a varied choice that differed from the usual and boring crème brulée, cheesecake, chocolate fondant etc etc. It’s a formula far too many restaurants stick to religiously. 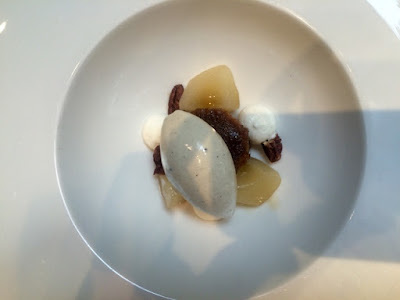 Desserts at Clos Maggiore were original and inventive. The Boyfriend’s black truffle ice cream topped a delicious cake (that was something like syrup or toffee flavoured, I can’t remember the menu description) and some beautifully sweet poached pears. The ice cream was a little savoury for my liking but I do enjoy trying new things. My dessert offered slightly more conventional flavours done in a totally original way. I shared the little mini muffins, being a good girlfriend, and gave one to The Boyfriend. They were lovely and sweet and a nice little taster of something that might be a bit too sickly if served in a larger form. The Baileys foam could have had a bit of a stronger flavour of the actual Baileys itself, but was perhaps just overpowered by the coated hazelnuts (which were delicious) and the smooth and silky pannacotta beneath. 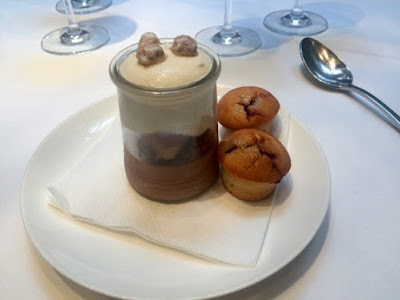 Please bear in mind, I have been picky with my minor criticisms of the food at Clos Maggiore, It was excellent food. Whilst it may sound like the overall setting and atmosphere of the restaurant was the best thing about Clos Maggiore, it wasn’t. The service was the best thing about Clos Maggiore. It was truly outstanding. The waiters were so on the ball, I never reached the bottom of either my wine or my water glass as each were regularly topped up by staff who were doing regular rounds to check everyone’s glasses. The staff were always there when you needed them but were by no means hovering over you or over bearing. The epitome of classic French service, always there but almost invisible in the background. I can whole heartedly state this was the best service I’ve ever experienced in any restaurant.Clos Maggiore is the ideal restaurant for a special occasion. Birthdays and other celebrations would be made really special in this superb setting and I imagine they’ve had more than their fair share of proposals. The Boyfriend and I agreed that we’d definitely be coming back to mark our special occasions and have recommended it repeatedly to friends ever since. I knew that Clos Maggiore had a good reputation but it is rare that a restaurant, not only lives up to, but totally exceeds the expectations you have of it.